With all the modeling out of the way it�s time to start setting up the environment for our scene. The idea for the setting will be up in the clouds with a warm glow feel about it. The sun will be visible and give the impression of early morning or end of the day depending on how you look at it. Creating the right atmosphere can be tricky and involves a lot of time spent experimenting with various settings before you get the desired effect. There is no quick formula in creating atmospheres that look right and a lot of the time it can be frustrating. 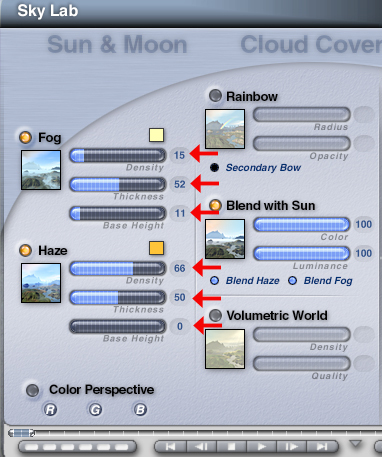 The only tip I can give here is to experiment and learn how the different features such as lighting, sun settings, haze, and cloud settings interact with each other. Observing the sky for real can help as well. See how the sky changes at different times of the day and try to implement that into your work can help. To create the sky in the scene open up a new file in Bryce and enter the Skylab. 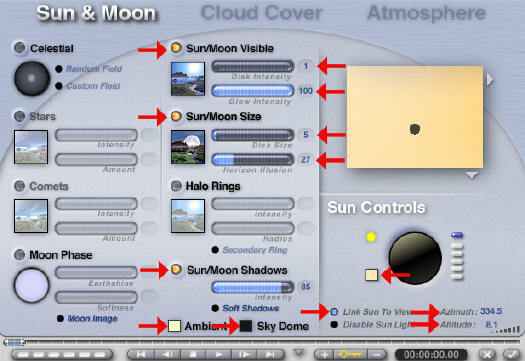 Use the examples provided to change the settings accordingly for the Sun & Moon section. The red arrows highlight the areas that need to be changed. 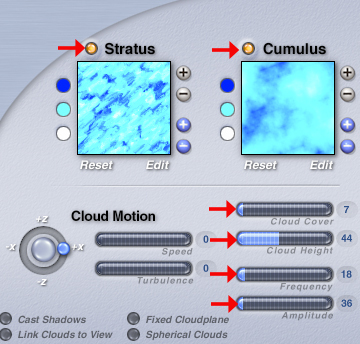 Once the sky is set, add the sky to your preset Sky Library. You could also just import the included Sky file from the support files folder, but that wouldn't be fun and you wouldn't learn anything.